Children can choose what they want to do during this part of Cròileagan – each week there is a different activity organised – such as making cards and even Olympic torches! We also have a lovely selection of toys and resources and the playleaders rotate these so there are different things for the children to play with each week. The children have a snack – normally each parent brings along something small to be shared like a piece of fruit or a few rice cakes or some raisins – and we divide these up. Grown-ups usually take turns to help prepare snack – but don’t worry about this on your first few visits, as we normally have plenty of help. 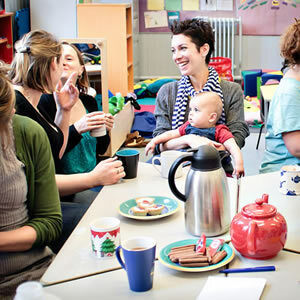 After snack time, we all tidy up – grown-ups and children help to tidy away the toys and a couple of grown-ups tidy up the snack things and wash up. 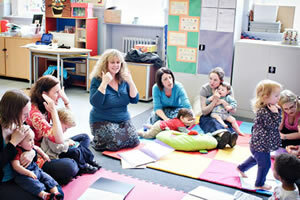 Once everything is tidied away, we have some joint activities, such as singing. Our song books are in Gaelic and English so it’s a great way for grown ups to pick up a few words and the children really enjoy all the activity songs. 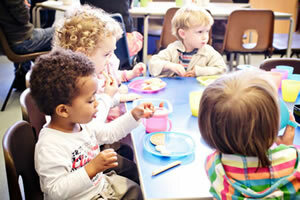 It also gives the playgroup leaders a chance to tell us about any news or events coming up. A little something for snack time and 50p per session for each family. Aig an àm seo de Chròileagan faodaidh a’ chlann taghadh na thogras iad. Cuiridh sinn air dòigh cur-seachdan ùr gach seachdainn – lèithid dèanamh cairtean neo fiu’s biùgan Olimpigeach! A bharrachd air sin, tha roghainn mòr againn de dhèideagan agus stùthan eile a tha air an atharrachadh gu tric, mar sin faodaidh na cloinne a’ cluich le ruideigin diofraichte gach seachdainn. Bidh blasad-bìdh beag aig a’ chloinn – mar as àbhaist bidh na pàrantan a toirt leotha ruideigin beag airson roinn eadar na h-uile – ni pìos measain neo rud sam bith aotrom an gnothach. Bidh na h-inbhich a’ roinn obair ullachaidh a bhìdh- ach na gabh dragh mu dheidhinn seo air a’ chiad turas no dhà agad; mar as trìce tha gu lèor cuideachaidh againn! Fhad’s a tha a’ chlann ag ithe, faodaidh na h-inbhich fois a ghabhail agus cupa tì neo cofaidh òl (bidh briosgaid neo trì againn cuideachd!). As dèidh blasad-bìdh, bidh sinn uile a’ sgioblachadh suas – bidh sinn uile a’ cuideachadh le bhith sgioblachadh nan dèideagan agus bidh inbheach neo dithis a’ cur air falbh nam pìosan bìdh agus a’ nighe nan soitheachan. Nuair a tha gach nì air falbh, tha cur-seachadan againn còmhla, mar seinn. Tha na leabhraichean òrain againn sa Ghàidhlig agus Beurla, mar sin se dòigh glè mhath a th’ ann airson nan inbheach facal neo dhà ag ionnsachadh. Tha na h-òrain beòthail a’ còrdadh ris a’ chloinn gu mòr. Tha e cuideachd a’ toirt cothrom do na stùirichearan innse dhuinn mu naidheachd no tachartasan sam bith. De bu chòir dhut toirt leat? Greim bìdh agus 50sg gach turas airson gach teaghlach.